It would be extremely difficult for The Movie Mind to startle you in the beginning of this review to the extent that you will be startled from the beginning of this film. Let’s just say if I can grab your attention only half-as easily as the first minute of Before the Devil Knows You’re Dead, this will be a successful review. At the risk of giving too much away, let’s just say that you should mentally prepare yourselves for seeing two Oscar winners in all their “glory”. While you might think it sounds like a ploy to create shock value in lieu of a good story, let me assure you that the rest of the film does not disappoint and somehow keeps us as shocked as the first minute. Trust me when I say that is the biggest compliment I can give this film. This film does not get by on high-speed action and a surprise ending. Instead, it relies on a good old-fashioned story and some incredible depth in its characters. The profound “event” in the script is presented up front. We learn some additional little bits and pieces about its surroundings as the film continues, but the true joy here is learning how we got there. I can appreciate that the story is presented to us right from the outset and how each layer is peeled back slowly as the film progresses. However, the real enjoyment is watching these characters unfold before our eyes and reveal depth that 90% of Hollywood would not be able to pull off. 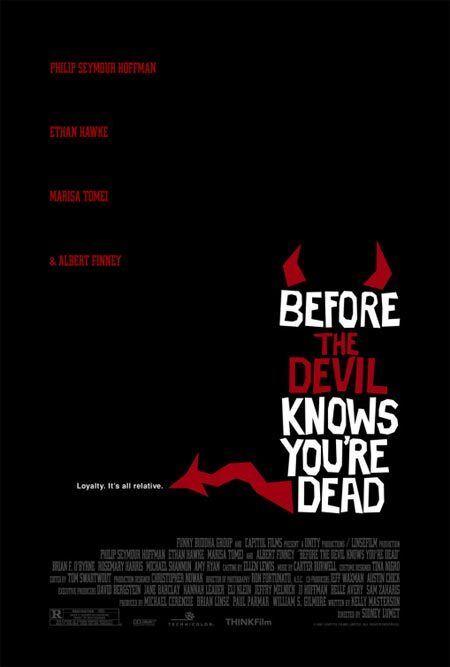 Before the Devil Knows You’re Dead is a story about what happens when people make bad choices and compounds them with even worse choices. It is also about how the actions of characters can have much deeper meaning than we thought could be conveyed in 2-hours on the big screen. It takes true talent to be able to portray this effectively. As Andy Hanson, Philip Seymour Hoffman is so good at playing a despicable person that I almost want to like him less. It only goes to show how truly gifted he is, albeit in a different role for him than we are accustomed. Andy is a character that needs to get out of the life rut he is in and thinks an easy payday is the best way to do it. Troubled by a growing drug addiction, marriage problems, and some deep-rooted issues from childhood, he decides the easiest target is his parents’ suburban jewelry store. He convinces his dimwit brother Hank (Ethan Hawke) to go along with his hair-brained robbery idea. The only problem is that Hank manages to screw something up in the heist, just like he has managed to do his whole life, creating a spiraling chain of events that unleashes the worst in all involved. Hawke plays an amazing “patsy” as the brother who may look like the bigger screwup on the surface, but eerily may be the one who has it more together. Hoffman’s issues run deep to the point of jealousy of his father’s love for his brother, and we soon find out there was more to the heist than we thought. You would be hard-pressed to find a film with better acting performances than this. Even Tomei manages to come up with a nice performance, surprisingly so when it initially appeared she would go through the entire film stark naked. Albert Finney is just plain weird, but does a hell-of-job playing the father who clearly was not the glue who held the family together. It’s not a film for too many memorable one-liners, or big-budget special effects. Nor will there be any crazy double-crosses or quick editing cuts that make you dizzy. But if you are looking for a film with a great story and some of the best acting performances by an entire cast that you have seen in a long time, you should look no further. Interesting Cameo Appearance: Rosemary Harris (May Parker, mother of Peter Parker in the big-screen Spiderman trilogy) as Nanette Hanson, mother of both whacked-out sons (PSH and Ethan Hawke). Dex: Do you mind if I call you Chico? Andy: I used to think you had the world by the balls. Now I’m not sure you’ve even got any.